In keeping with current trends, supergroup Black Country Communion (featuring Joe Bonamassa, Jason Bonham, Glenn Hughes and Derek Sherinian) are giving away a free download of their single 'One Last Soul'. 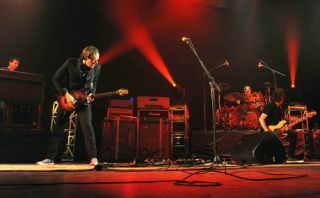 The track is taken from the four-piece's forthcoming self-titled debut album, due for release 20 September and features a considerably more rocky Joe Bonamassa flexing his riffing fingers. To get hold of the free track, which you can hear below, head to the Black Country Communion webstore and enter the promo code "OLS2010" at the check out.